City Soil cultivates and sustains agricultural projects from neighborhood gardens to commercial farms. in-vessel commercial composting and anaerobic digestion facilities to decentralized compost operations serving community gardens, farms, schools and and residential backyards. Our team's breadth of experience and expertise puts us in a unique position as we move into a new era of sustainable agriculture and organic waste recycling. City Soil has pioneered the design and construction of educational outdoor classrooms, greenhouses, living roofs and growing systems with many leading nonprofits and environmental organizations. We provide soil, compost, mulch and our specialized 'grow-how' to community gardens, landscapers, agricultural startups, and homeowners. from consumers, city residents and from skilled and aspiring growers. The expansion of local and urban agriculture is supported by federal, state and municipal policies and programs. City Soil works with public agencies, nonprofit groups, and local businesses to create healthy soil and build highly productive growing systems. institutional food waste in 2014 is setting a standard for the nation. The Commonwealth's composting and bioenergy infrastructure must be expanded to meet waste diversion goals; we need more effective composting and bioenergy systems with qualified operators in diverse settings. City Soil channels market forces, government policy, funding programs, and philanthropic initiatives to establish a more diversified network of sites to manage society's biodegradable wastes. recycling systems that provide completely contained management to process food residuals diverted as the food waste ban is implemented. BioEnergy Farms harvest heat and CO2 generated by the composting process and anaerobic digestion facilities to support year round greenhouse growing. 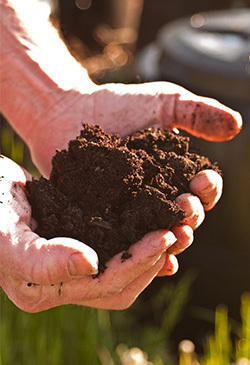 BioEnergy Farms process food waste, manures, and clean yard waste into high-quality, independently-certified compost while creating local 'green collar' jobs. sustainable agriculture and energy innovation. Our services help grow the region's organic waste recycling infrastructure by integrating renewable energy production with healthier, more productive soils and landscapes that are resilient to the effects of climate change. City Soil provides the essential services and products that sustain our local economy, our community and our environment. Visit City Soil's retail site on American Legion Highway for high quality, locally produced compost, mulch and topsoils!